If you have good hand-eye coordination and enjoy working with people, you may love being a medical diagnostic sonographer. However, before you can join this exciting and quickly growing field, you will need to attend one of the country’s sonography schools. These schools are present in over half of the states in the country, and currently there are 191 programs. These schools include hospitals like the University of Colorado Hospital in Denver which offers one year certificates in the field. They also include two-year technical schools like the Delaware Technical and Community College in Wilmington, Delaware which offers an associates degree in the field. Lastly, this list of schools also includes universities like Boise State University in Boise, Idaho which offers both a certificate and a bachelor’s degree in sonography. When you decide to enroll in one of these schools, you will have to determine how long you want to go for. The one-year course is particularly useful for people who are already working in the medical field who want to increase their salaries or advance their careers by adding an additional certification. The two-year degrees are the most common, and they are just as good as the four-year programs according to most experts. In addition to deciding what length of program they want to attend, students will also have to decide what they want to specialize in. Certain schools offer different specialties. All schools offer a general program, but some schools allow their students to select a specialization in cardiac or vascular sonography. 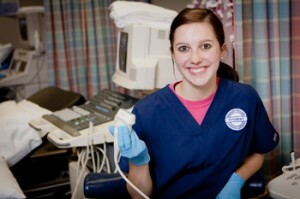 The courses that you take while at one of these ultrasound technician schools will vary depending upon your specialty. However, they will all be somewhat similar. Some courses will teach you how to use the machinery that you will spend your day using. This machinery is high-tech equipment that uses sound-waves to make images of internal organs. Because it uses sound waves, it is also called ultrasound equipment. Other courses will tell you how to decipher the images that you see. It is important to be able to understand what you are seeing as you take these images. However, most of the diagnosing that is done based on these images will actually be done by the doctor who ordered the ultrasound. The doctor may also give you directions regarding the exact angles and positions that they want the images taken from. The other classes that students take at sonography schools cover scientific topics like biology. Attending a sonography school is the first step toward pursuing a career in this field. If the work sounds exciting to you, you should contact the schools in your area or investigate the ones we have listed above and request more information. Then, all you have to do is apply, get accepted, and study, study, study.